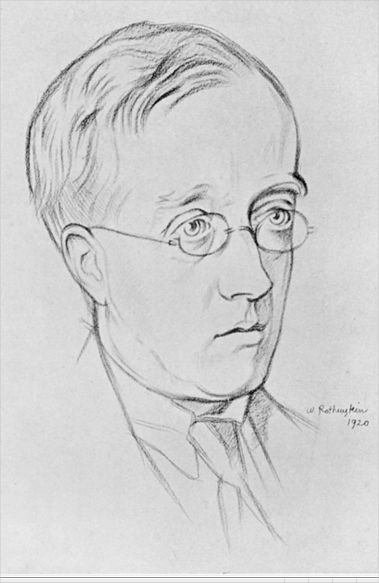 Today is the birthday (1874) of Gustavus Theodore von Holst, or, as more commonly known, Gustav Holst. Despite the name he was English, born and raised, although his paternal line was quite mixed. He was a well known composer and music teacher, best remembered for his orchestral suite The Planets. The rest of his work is poorly known, undeservedly so. The Planets was not his favorite piece, yet none of his other works has achieved anything like its success, much to Holst’s chagrin in his own lifetime. For well over 50 years after his death pieces other than The Planets were rarely performed or recorded, leading to the impression that he was a “one hit wonder.” It is precisely because of the phenomenal success of The Planets and its marked departure from his other compositions that the bulk of his oeuvre even now lies in obscurity. Holst was born in Cheltenham in Gloucestershire, the elder of the two children of Adolph von Holst, a professional musician, and his wife, Clara Cox. She was of mostly British descent, daughter of a respected Cirencester solicitor. The Holst side of the family was of mixed Swedish, Latvian, and German ancestry, with at least one professional musician in each of the previous three generations. Holst’s great-grandfather, Matthias Holst, born in Riga, in Latvia, was of German origin. He served as composer and harp-teacher to the Imperial Russian Court in St Petersburg. Matthias’s son Gustavus, who moved to England with his parents as a child in 1802, was a composer of salon-style music and a well-known harp teacher. He appropriated the aristocratic prefix “von” and added it, without authority, to the family name in the hope of gaining enhanced prestige and attracting pupils. Holst’s father, Adolph von Holst, became organist and choirmaster at All Saints’ Church, Cheltenham. He also taught, and gave piano recitals. His wife, Clara, a former pupil, was a respected singer and pianist. 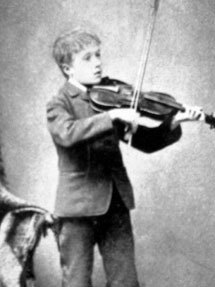 Holst began his musical career by learning piano and violin. However, he was a weak and sickly boy with poor eyesight, asthma, and painful tendinitis in his right arm which made piano (and organ) playing difficult as he got older. In fact it became so painful that when he was composing The Planets he had to have copyists write the score down for him. His father suggested that he take up trombone to help with the asthma, and for several years as a young man he supported himself by playing trombone in orchestras, one of which played light Viennese music which Holst referred to as “trashy” and “criminal.” His lifelong friend, Ralph Vaughn-Williams, observed that although Holst was not always excited by orchestral playing, it was this experience that developed his keen sense of the internal structure and dynamics of the orchestra. 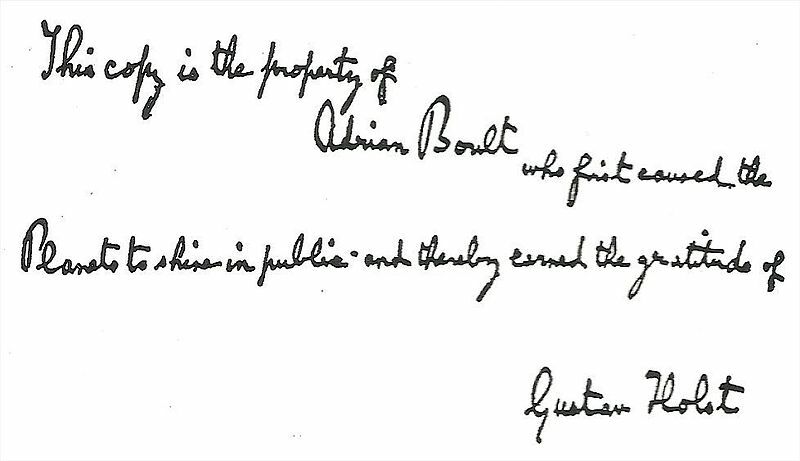 In 1903 Holst’s father died, leaving him a very small legacy. 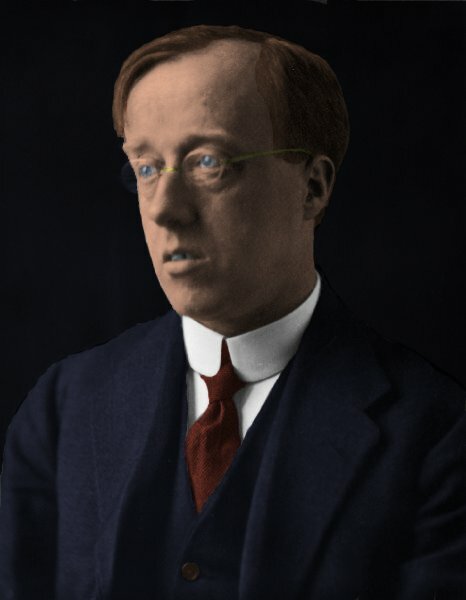 Holst and his wife decided, as she later put it, that “as they were always hard up, the only thing to do was to spend it all at once on a holiday in Germany.” While in Germany, Holst reappraised his professional life, and decided to abandon orchestral playing to concentrate on composition. His earnings as a composer were too little to live on, and two years later he accepted the offer of a teaching post at James Allen’s Girls’ School, Dulwich, which he held until 1921. He also taught at the Passmore Edwards Settlement, where among other innovations he gave the British premieres of two Bach cantatas. The two teaching posts for which he is probably best known were director of music at St Paul’s Girls’ School, Hammersmith, from 1905 until his death, and director of music at Morley College from 1907 to 1924. In both places he proved to be a dedicated, exacting, and innovative teacher, much loved by his students. As a composer Holst was frequently inspired by literature. He set poetry by Thomas Hardy and Robert Bridges and, a particular influence, Walt Whitman, whose words he set in “Dirge for Two Veterans” and “The Mystic Trumpeter” (1904). He wrote an orchestral Walt Whitman Overture in 1899. While on tour with the Carl Rosa company Holst had read some of anthropologist Max Müller’s books, which inspired in him a keen interest in Sanskrit texts, particularly the Rig Veda hymns. Because he was not satisfied with the translations, he learnt Sanskrit and produced his own translations which he then used for his settings. Such pieces include Sita (1899–1906), a three-act opera based on an episode in the Hindu epic Ramayana; Savitri (1908), a chamber opera based on a tale from the epic Mahabharata; four groups of Hymns from the Rig Veda (1908–14); and two texts originally by K?lid?sa: “Two Eastern Pictures” (1909–10) and “The Cloud Messenger” (1913). 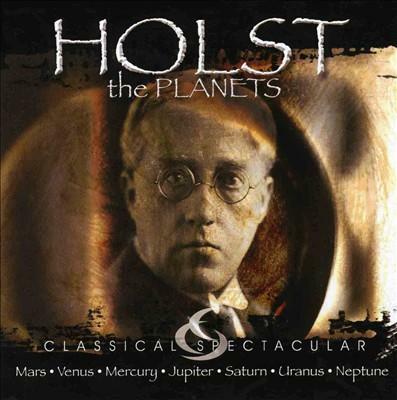 Holst began work on The Planets in the spring of 1913. The concept of the work is astrological rather than astronomical (which is why Earth is not included). Each movement is intended to convey ideas and emotions associated with the influence of the planets on the psyche, and not necessarily the Roman gods, although there are overlaps (as in the case of “Mars, The Bringer of War” for example). The idea of the work was possibly suggested to Holst by composer Clifford Bax, who introduced him to astrology when the two were part of a small group of English artists holidaying in Majorca. 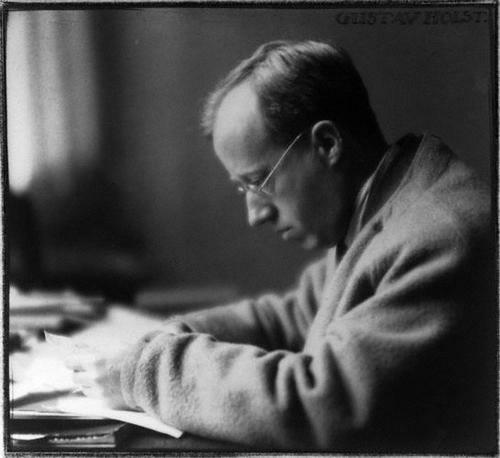 Holst became very much taken with the subject, and liked to cast his friends’ horoscopes for fun. The Planets is innovative in so many ways, perhaps most obviously, Holst’s use of a richly complex orchestra produces startling tonal effects. The percussion section alone has six timpani (requiring two players), bass drum, snare drum, cymbals, triangle, tam-tam, tambourine, glockenspiel, xylophone, and tubular bells. There are also the unconventional meters, ambiguous tonal centers, and imaginative combinations of instruments. Certain passages are justly famous, such as the euphonium solo in “Mars,” the “hymn” in the center of “Jupiter” (that became, with Holst’s full approval, the music to an actual hymn, and is now needlessly overused), and the haunting ending of “Neptune” which concludes the suite. “Neptune” was one of the first pieces of orchestral music to have a fade-out ending, as opposed to the usual full-throated dramatic ending that acts as a grand, final punctuation mark to orchestral pieces of the time. Neptune concludes with two three-woman (SSA) choruses eerily singing wordlessly along with the orchestra which slowly fades away leaving the choruses singing alone. 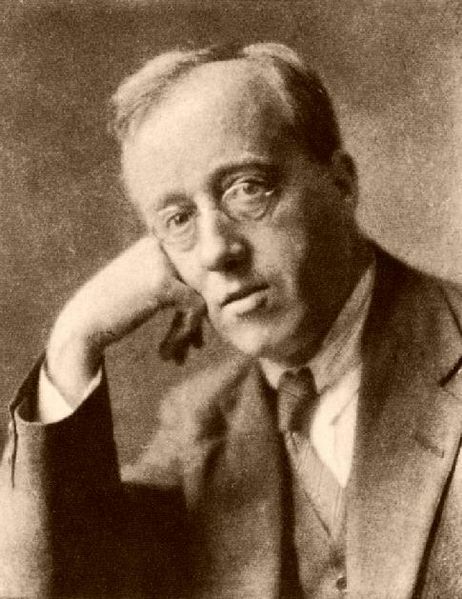 Holst stipulated that the women’s choruses are “to be placed in an adjoining room, the door of which is to be left open until the last bar of the piece, when it is to be slowly and silently closed”, and that the final bar (scored for choruses alone) is “to be repeated until the sound is lost in the distance.” The effect absolutely entranced contemporary audiences who probably had never experienced its like in an orchestral piece before. 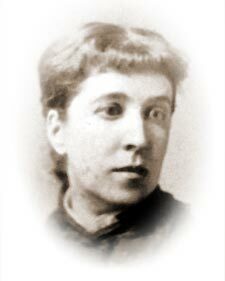 Holst’s daughter Imogen remarked that the ending was “unforgettable, with its hidden chorus of women’s voices growing fainter and fainter… until the imagination knew no difference between sound and silence.” Whenever I have heard it performed there is always an expectant pause before the applause because it is never quite clear to the audience when the piece has actually finished. 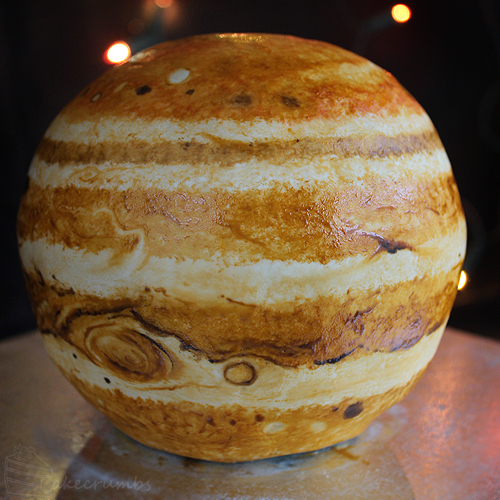 Holst grew to despise the popularity of The Planets and composed in its shadow for the rest of his life. He was by nature a timid and retiring man who hated the limelight and wished to be left alone to compose in peace. He carried typed cards which he would give to autograph seekers that read, “I do not hand out my autograph.” People constantly clamored for more “mood pieces” like The Planets, and were disappointed when he refused to oblige. He once said (to Clifford Bax), “If nobody likes your work, you have to go on just for the sake of the work. And you’re in no danger of letting the public make you repeat yourself. Every artist ought to pray that he may not be ‘a success.’ If he’s a failure he stands a good chance of concentrating upon the best work of which he’s capable.” Some of his “best work” came after The Planets: work which Holst himself preferred, such as “Egdon Heath,” a tribute to Hardy’s Wessex which Holst considered his finest composition. But his later work never achieved critical success. 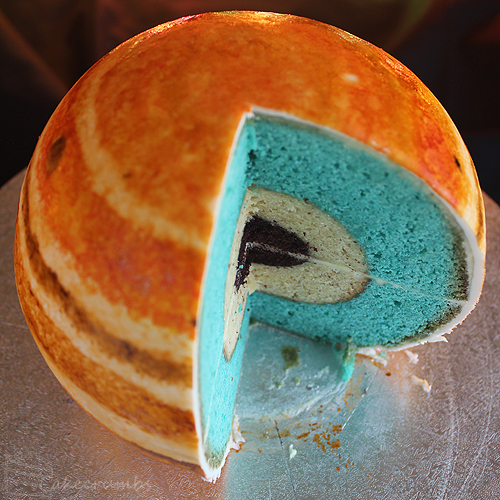 Whilst pondering what recipe to give you in honor of Holst I came across this cake in the shape of Jupiter. Simply amazing. I’m not even going to attempt to reproduce a recipe. Instead I am going to point you to the blog where I found it. It’s called Cakecrumbs by an Australian zoology graduate called Rhiannon who is a self-taught baker/cake decorator.